This fried fish recipe of mackerel is ready in minutes. With no marination time, no fuss no muss recipe with just a few spices but tastes heavenly. Normally fish fry is a meal containing battered or breaded fried fish. But in southern India, it is something spicy, tangy, crispy and much more combination of flavours. Pan fried recipe of Mackerel fish tastes outstanding than when curried. 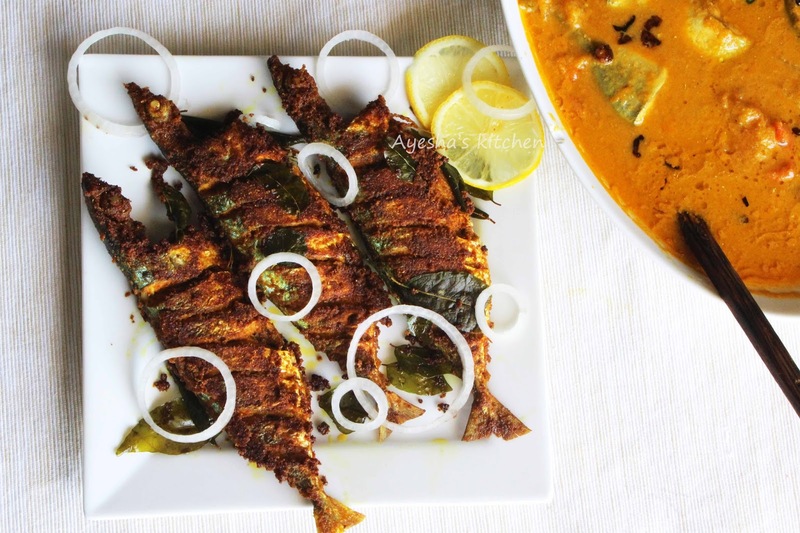 Indian Mackerel is an important food fish which is commonly used in South and Southeast Asian cuisine. It is known by different names like Ayala / Aiyla, Kembung, Bangda, Bangude and like so. Fresh Mackerel fried with hot steamed rice is an outstanding meal combo for lunch. I always love simple mackerel recipes with no fuss no muss. 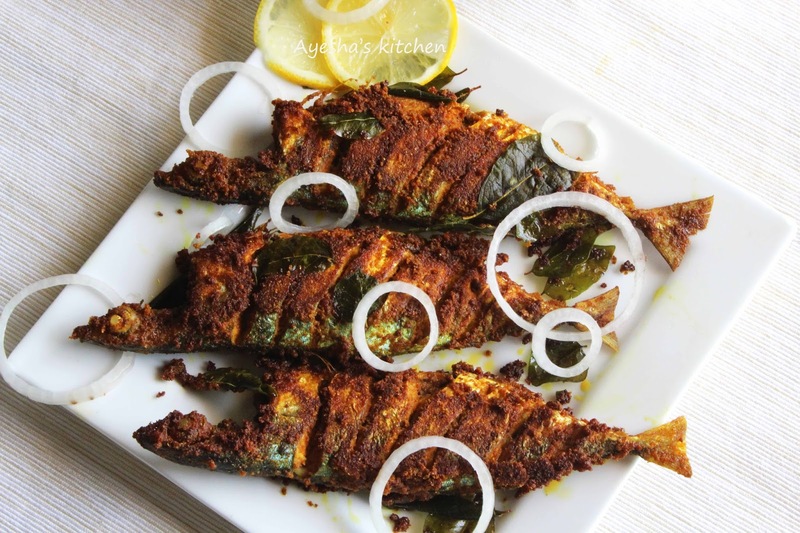 Do try this fish fry recipe with Mackerel fish. Here is the recipe showing how to fry fish/recipe for fried fish /fish batter recipe/fish fry batter/fish dinner ideas/ Kerala fish fry recipe. Add turmeric powder, chilli powder, coriander powder, salt, vinegar and pepper powder in a bowl. Combine very well and make a thick paste. Do not add water. I used to add more coriander powder when the batter is watery (am using homemade coriander powder with no other spices, but in store-bought they will add raw garam masala and other spices along with raw coriander seed which leaves a pungent taste to coriander powder). Now rub this marinade all over the fish with your hand. Also, rub inside the slits of mackerel well. Fish must be well coated with the marinade. When hot, add the curry leaves and make the flame to medium. Serve along with hot steamed rice and dal curry. Yummilicious!! !